Scope, schedule, organization, risk and cost baselines are the fundamental elements of a Project Plan, defining the What, When, Who, and How of everything necessary for successful project execution. The direction, tempo, resources and deliverables of our projects are driven by the plan baselines. We measure the degree to which we are successfully executing the project, by the variances from the baselines in our plan. Finally, we manage the risks to our baselines by using reserves, buffers and other methods, to protect the project from uncertainties and threats. On the surface, this all seems to be the domain of “left-brain” analytical thinking, or in other words, the Science of Project Management. I’m convinced however, that to be better Project Managers we must both acknowledge importance of, and increase our use of, a more “whole-brain”, thinking approach that incorporates the Art of Project Management. Our thinking must be artful and creative as well as analytical and logical. Most Project Managers probably don’t think of themselves as artists, but in this blog I’m going to explore the notion of the Project Baseline Management through the perspective of a “Project Manager Artist”. So, with that as a theme, here we go! It seems to me that at the end of the day, this list of artistic project baseline attributes is not all that different than a traditional project baseline attributes list that we would make, using analytics and logic. The reason for that is perhaps, that subconsciously, even the most practical of us, want our otherwise utilitarian work products to also be works of art that are beautiful in their own way. • Create a project baseline vision for your project team before creating the work itself. • The baseline artwork should be designed to support the timeline of the project and major changes should be few. However, when significant changes are necessary they should be evaluated with a critical eye that ensures preservation of the basic ideas and principles, and implemented with the same care and collaboration as the original artwork. I know that analogies like the one I’ve presented here can be powerful and useful, yet trivial, and even and dangerous. My intent in this, and my other blog posts, is to provoke the consideration and inclusion of non-traditional project management thinking processes that I believe will improve the products and enrich the experience of our profession. To the extent that I may have stretched the artistic baseline management analogy too far for some or you I apologize, but for the rest, I hope you find it of value. What are your thoughts about the concept of the Project Manager as an Artist? I’d very much appreciate your comments, as well as those of any colleagues with whom you would care to share this blog. This entry was posted in Best Practices, Better Thinking, Leadership, Personal Development, Program & Knowledge Management, Project Baseline Management and tagged Art of Project Management, Project Baseline Management, whole brain thinking. Bookmark the permalink. Interesting analogy but I doubt that most PM’s will be able to make a serious connection to it. Now if you likened the art of project management to air traffic control, you might have better connectivity. I think that the “art” of project management doesn’t necessarily reach into the processes of project management themselves; these are a science, and the quality of the project depends on them. Artful project management seems to have more to do with how a project manager communicates and the tools and systems they use to complete a project. Projects can be enhanced by artful communication; language and presentation are important, and the vehicles and styles we employ to communicate our message, be it a project baseline, a memo, a schedule or a poem, will always have an impact on the way it is received. In essence, part of the “art” of project management is in the effectiveness and creativity of the communication involved. The plethora of information and instructions can easily become a bore and a burden, but when the vision of a project can be communicated clearly, perhaps, as you said, in a thematic way, it can become compelling and inspiring for all those involved, from the stakeholders to the team members who will be executing tasks and projects. That being said, a subset of the art of project management (and it may be more foundational than subsequent) are the tools and systems used to implement the project plan. Some systems and tools can be cumbersome to use and don’t allow for a smooth workflow. If project managers are artists, or rather, artisans, they should use the most effective tools for their trade. For example, using Excel or other spreadsheet tools for scheduling team members or tasks is not as effective as using software which could employ an organized Resource Management tool or a Gantt Chart. These kinds of tools facilitate the key functions of the project manager, enabling them to skillfully fulfill their role and produce a clear product. 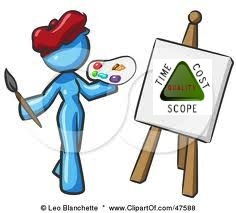 To summarize, it seems to me that can be helpful for project managers to think of themselves as artists in the sense that they should have the same care and intentionality for their work as any artist has for an individual masterpiece. In order to give stakeholders and team members a meaningful and enjoyable experience and produce something they can be proud of, project managers must engage in clear, effective communication and use the right tools for the job.